At Power Center Physical Therapy, Aquatics & Wellness, our staff will restore strength, mobility, balance, endurance and function following injury, surgery and illness. All of our programs emphasize alleviating current dysfunction, pain or deficits. Our ultimate goal is providing patient and care givers with information regarding their injury process and preventing future problems. 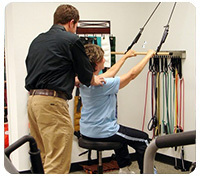 Our physical therapists are equipped with the knowledge and skills in the most current techniques and methodologies. If you experience dizziness, vertigo, lightheadedness, loss of balance, giddiness or loss of equilibium, then you need to see us! 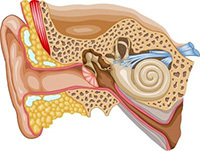 Symptoms of pressure or fullness in the ear, blurred vision with movement and balance problems combined with unsteadiness indicate the need for an evaluation from our physical therapists, who specialize in vestibular rehabilitation. Our certified Vestibular Therapists will perform a complete evaluation, which includes the observation of posture, balance, movement and compensation strategies to come to a conclusion about the course of treatment for you. We have a long tradition of providing high quality care for patients with orthopedic, arthritic, or athletic injury problems. All of our outpatient clinics provide evaluation and treatment of soft tissue injuries to the spine and peripheral joints; post-surgical rehabilitation utilizing state the art techniques and equipment; patient education and home exercise programs. Manual therapy, mechanical treatments and various modalities are also available. 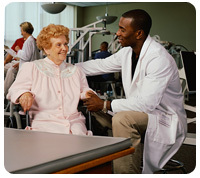 We specialize in post stroke rehabilitation, amputation rehabilitation, multiple sclerosis, Parkinsons disease, muscular dystrophy, peripheral neuropathy, peripheral vascular disease, head and spinal cord rehabilitation and community education programs. Aquatic therapy, Manual therapy, mechanical treatments, and various modalities are available.